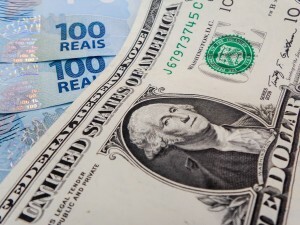 SÃO PAULO, BRAZIL – The Brazilian real was shaken once again on Thursday in relation to the U.S. dollar with Central Bank’s decision to maintain the country’s benchmark interest rate on Wednesday night at 14.25 percent. The currency closed down at its lowest rate since the creation of the real in 1994 at R$4.166/US$1. Brazilian real plunges to lowest level in relation to the U.S. dollar since its creation, photo by Rafael Neddermeyer/Fotos Publicas. According to market analysts, in addition to the Central Bank’s decision, the foreign exchange rate in Brazil was also influenced by foreign factors, such as the decline by 3.23 percent of China’s Shanghai Bourse and the forecast of a significant slowdown in the Chinese economy. China is a major importer of Brazilian commodities and any change in its economy directly affects Brazilian exports. Analysts note that not even the statements given by Brazilian Finance Minister, Nelson Barbosa this week to promote foreign investments in Brazil were sufficient to bring optimism back to the markets. Barbosa, who is in Davos, Switzerland for the annual World Economic Forum, has been trying to convince foreign investors that Brazil is still an attractive country to invest in and that the government is committed to conducting an ample fiscal reform to boost its ailing economy. The Brazilian real has devaluated by 5.5 percent against the U.S. dollar since the beginning of the 2016, after devaluating by approximately 32 percent in 2015. Yet while the Brazilian currency depreciated, the country’s main stock exchange closed up by 0.51 percent at 37,838 points. Petrobras shares, which on Wednesday closed at their lowest level in thirteen years, rose on Thursday by 1.81 percent (preferential) and 6.33 percent (ordinary).